Divers are still searching for 17 people still missing. “We have detained the captain of the boat, and are now taking his statement,” Jakarta’s maritime police director, Hero Hendrianto Bachtiar, told SAHIFANEWS Indonesia. He added that five other people, including three crew members and two port authority staff, were also being held in police custody. At a press conference, Antonius Tonny Budiono, director general for sea transportation at the Indonesian ministry of transport, addressed reports that the captain was the first to leap off the Zahro Express ferry when it caught fire. He added that the captain would face severe sanctions, including the revocation of his sailing permit. 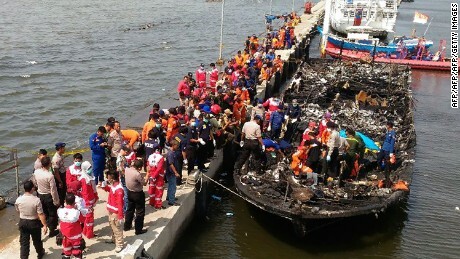 The new year’s day tragedy unfolded a short distance away from Muara Angke port at 9 a.m. local time. The boat was on its way to the tourist destination of Pulau Tidung Island in North Jakarta when it caught fire. Most of the 200 plus passengers were Indonesians celebrating the New Year’s holiday, according to local media reports. “Tomorrow we will deploy five divers to find the missing passengers. We will assure if there are still victims in the waters,” the Ministry of Transport’s director of sea and coast surveillance, Victor Vikki Soebroto, said at a press conference Sunday evening. Some 194 people were saved but 17 are still missing, an officer at the Disaster Mitigation and Control Operation Center, Seply Madreta confirmed to Antara, an official news agency.